It’s hard to believe that I used to gag at the thought of sushi! 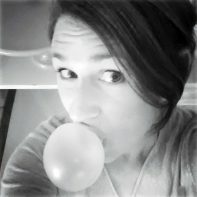 Now I actually crave it, and when it’s just the two of us, my husband and I often agree on sushi for dinner. It’s so much lighter than pizza and cheeseburgers, and I don’t feel as guilty digging into something like cheesecake when I’m done! 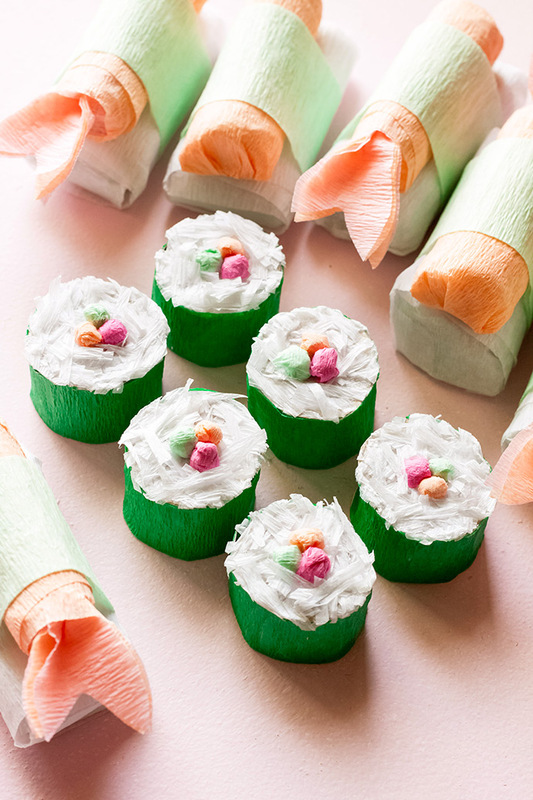 Now, this “sushi surprise” isn’t exactly the healthiest version, but it’s super cute and makes for a fun favor. 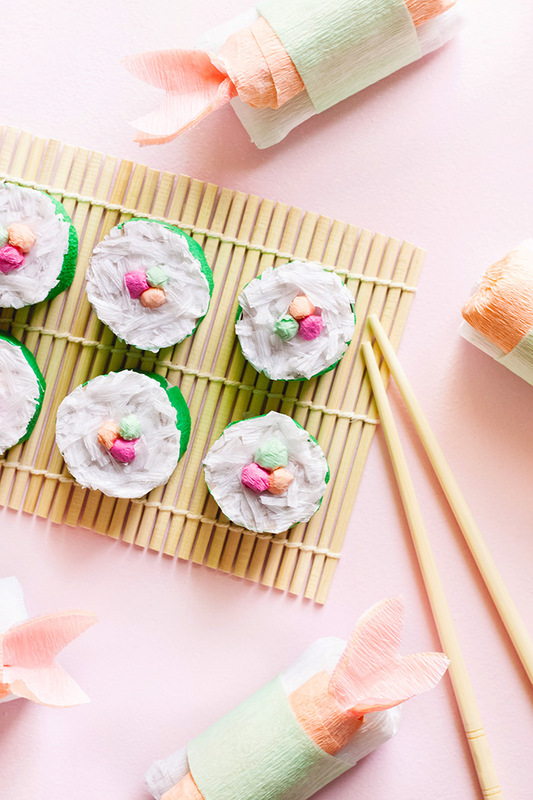 Can you imagine throwing a backyard party this summer with paper lanterns, sushi rolls, and twinkly lights, and then sending neighbors and friends (or their kids) away with these delightful little treats? 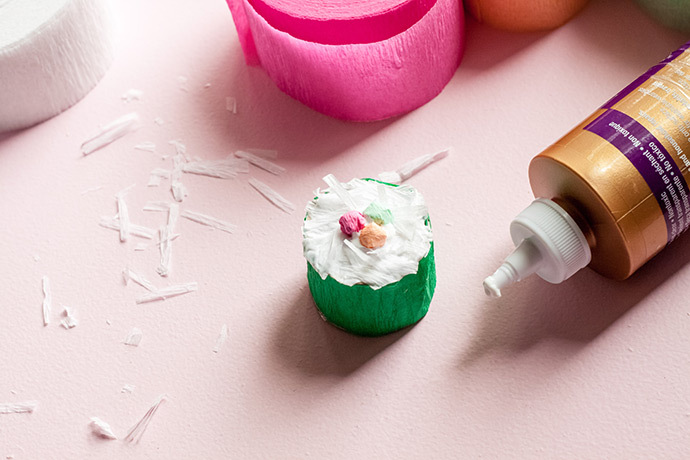 It would even be a fun way to serve dessert to the kiddos! 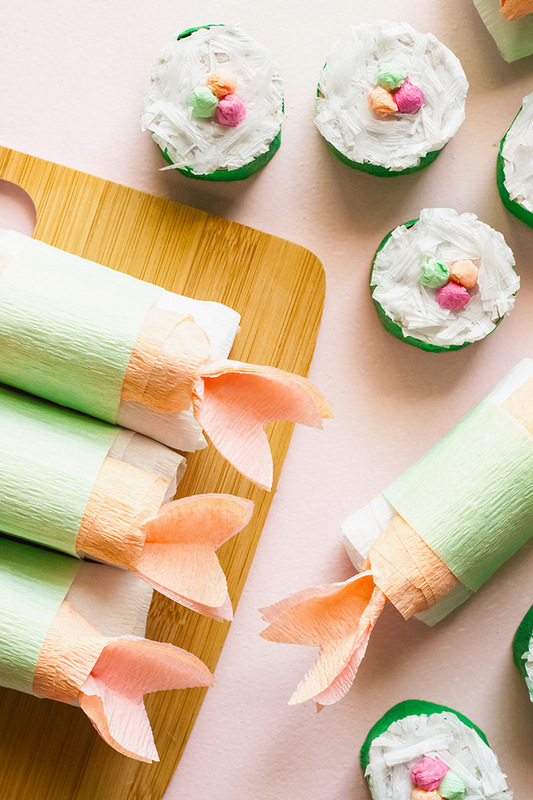 You just need a couple of sweets, toilet paper rolls, and party streamers, and you are ready to roll up some sushi surprise! 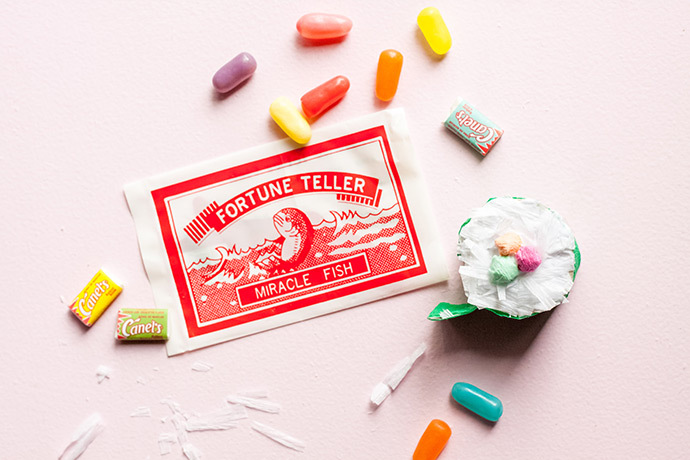 If you’re looking for a clever way to present some cash to the graduate in your life, you could easily roll up some money over the candy, and throw some quarters in the sushi roll for the laundromat! 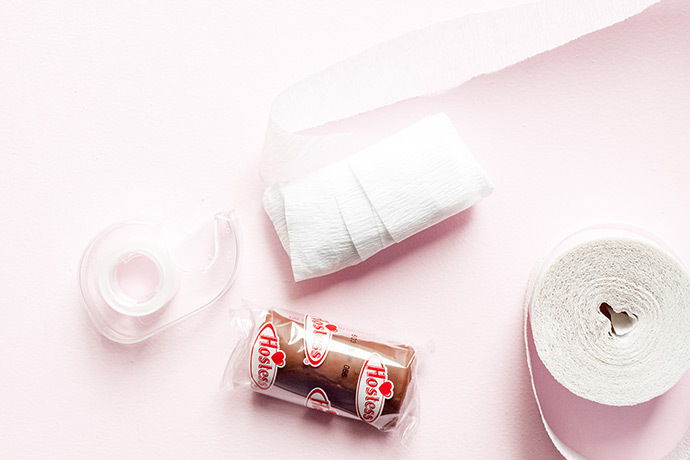 Tape a piece of white streamers over each end of your Ho Ho treat. 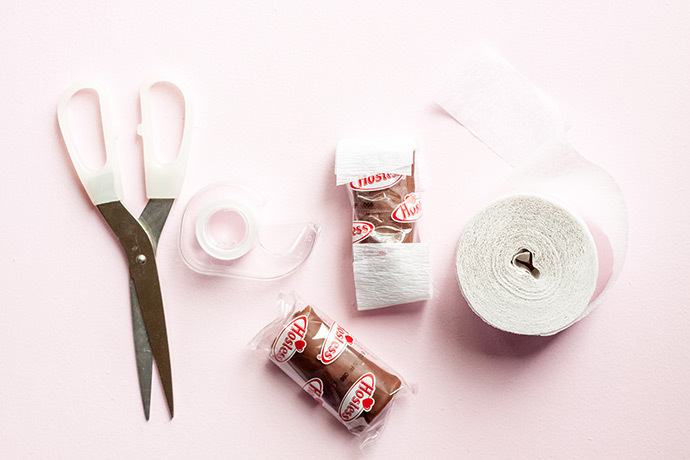 Carefully wrap the entire Ho Ho with white streamers, tucking in any wrapper or streamer pieces on the ends. You may need to wrap it twice for better coverage. End the wrapping on the bottom of the Ho Ho, and glue the end of the streamer to the bottom. Set aside. 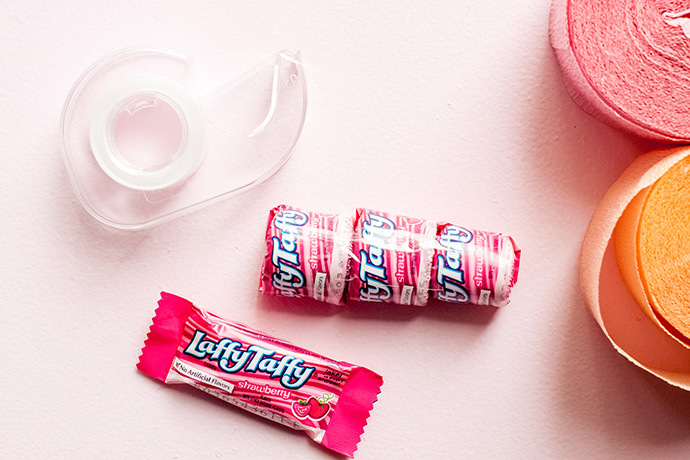 Fold three Laffy Taffy candies into an arch, making one arch smaller and tighter than the other two. Tape the ends of each arch together, to keep them in arch form. Next, line the three pieces up, with the smaller arch on one end, and put a piece of tape across the top of all three pieces to hold them together. You may want to flip them over and tape the bottom together as well. 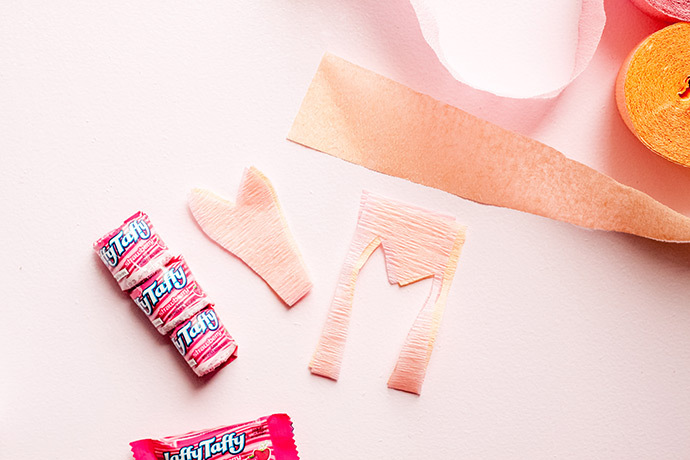 Tape a piece of peach streamers over each end of the Laffy Taffy roll. 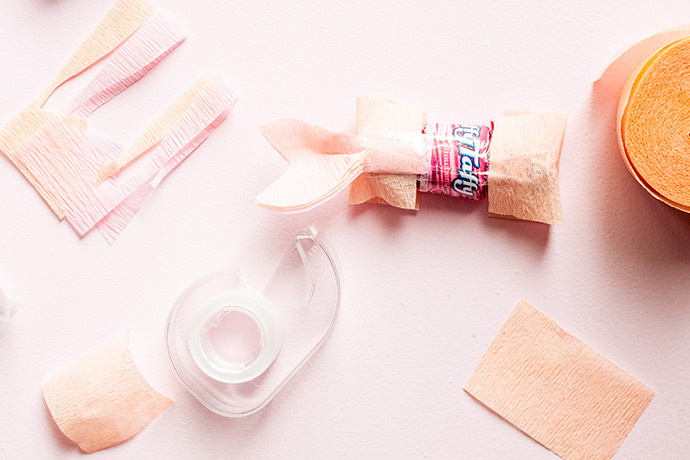 Now, take an 8” strip of peach and light pink streamers, place them on top of each other, and fold in half. 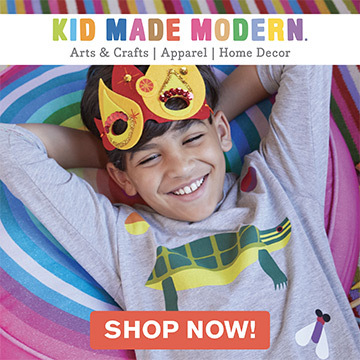 Cut a fish tail shape into the streamers, leaving a longer strip at the folded end. 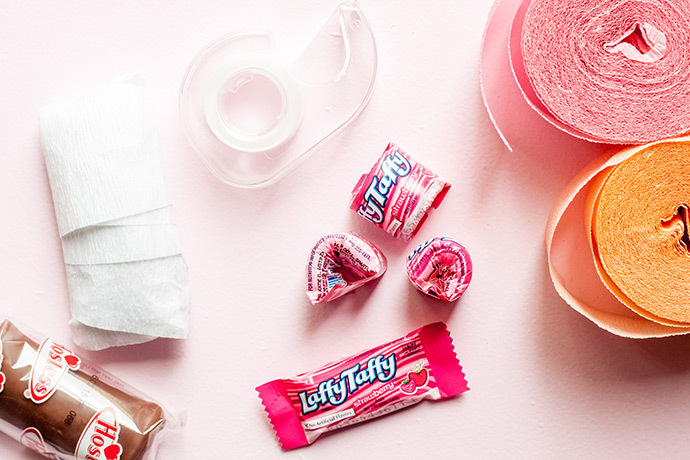 Squeeze the tail in the middle a bit, and tape the longer, folded piece to the skinnier end of the Laffy Taffy roll. 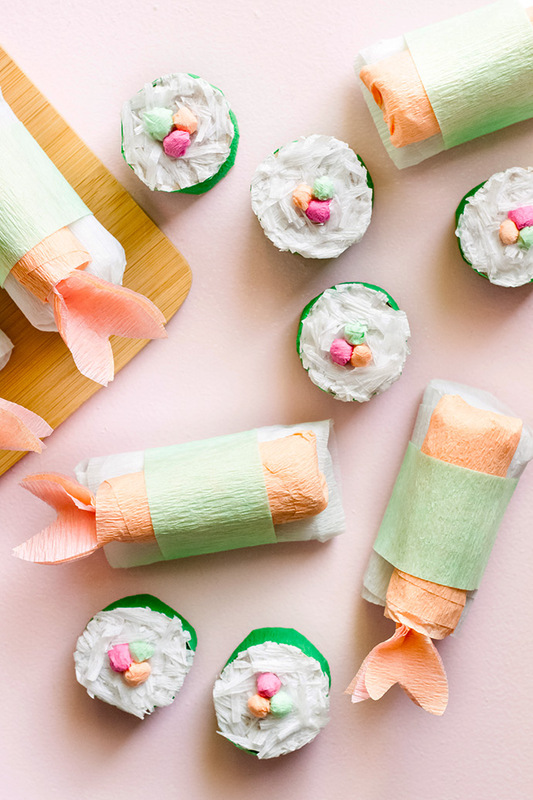 Next, starting at the tail end, wrap the Laffy Taffy roll in peach streamers. 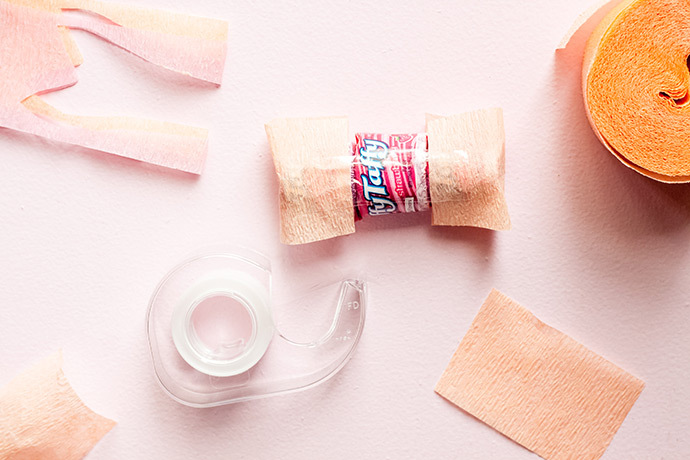 Glue the end of the streamers to the bottom, and use glue to hold down any pieces that aren’t lying flat. 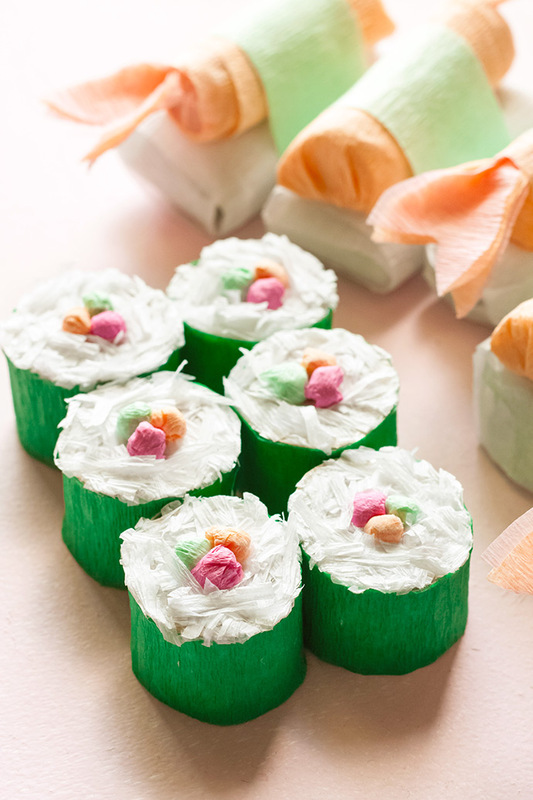 Place the peach sushi fish on top of the white wrapped Ho Ho, and use a mint green strip of streamers to wrap the two pieces together in the middle. 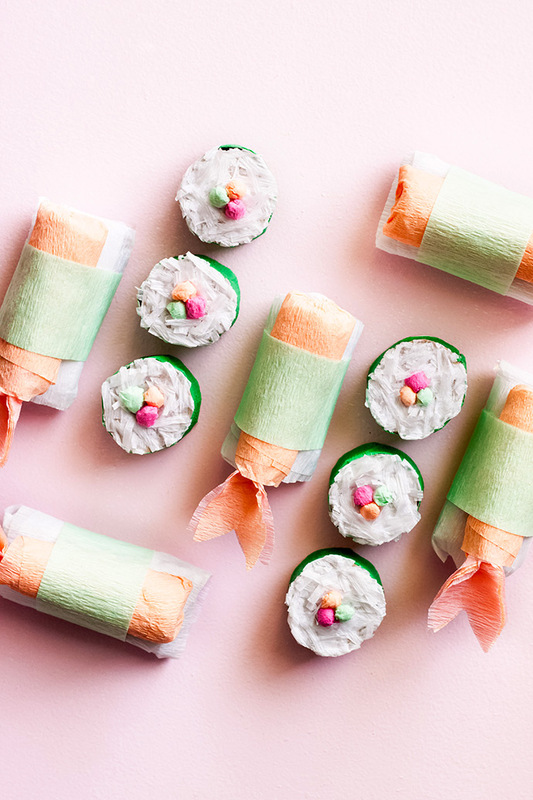 Once you have wrapped around the sushi pieces two times, use tacky glue to hold the mint green streamers together at the bottom. Cut about a 1” wide piece off the end of a toilet paper roll. Trace the circle piece onto cardboard two times, and cut the circles out on the inside of the lines. 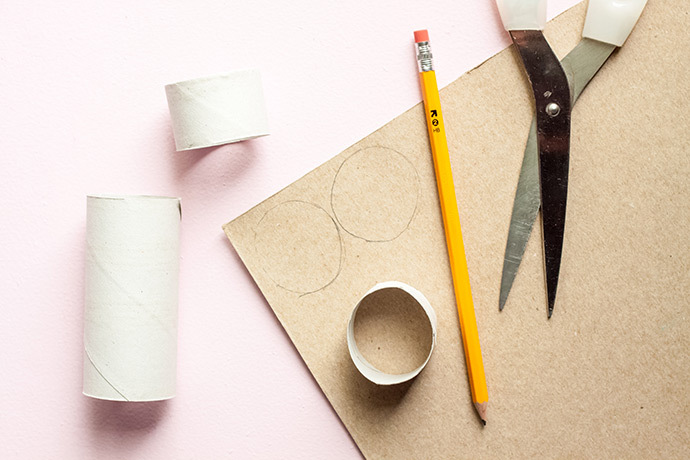 Cut a slit on one side of the toilet roll piece from top to bottom, and fold a 1” piece outward, and crease. 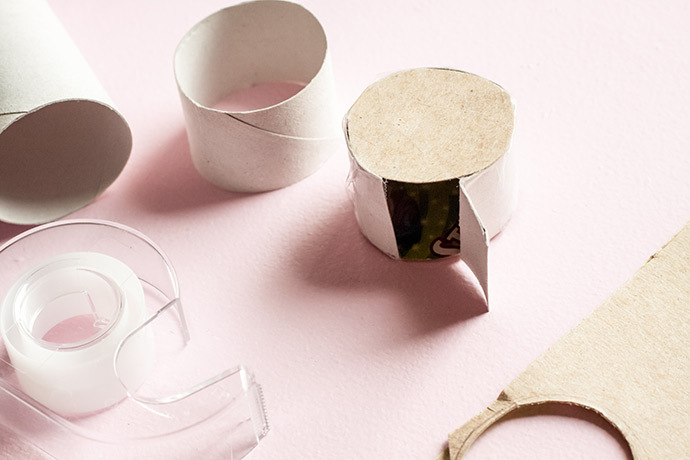 Tape the cardboard circles to the top and bottom of the roll, without taping the 1” flap. 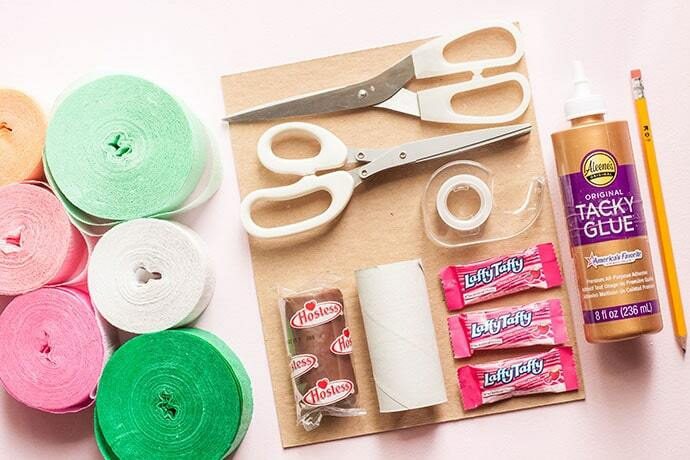 Cut a long piece of green streamers down to about a 1” width, and glue the end to the inside of the 1” flap. 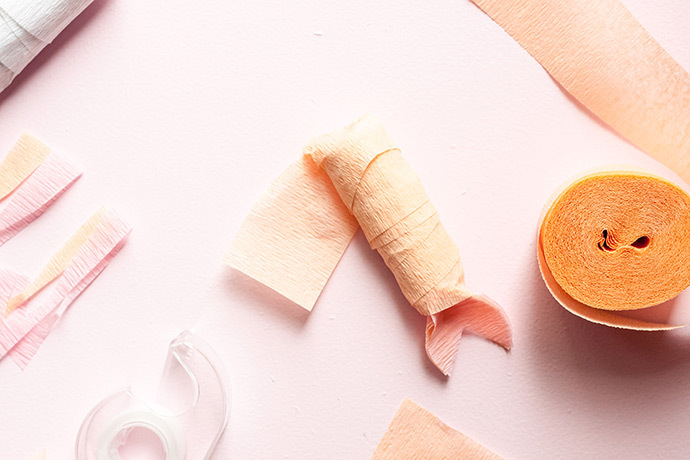 Wrap the streamer to the outside of the flap, and place a strip of glue at the outer crease. Press the streamers into the crease, and then continue wrapping the streamer piece all the way around the sushi roll. Once you get to the end, cut the streamer to fit the roll. 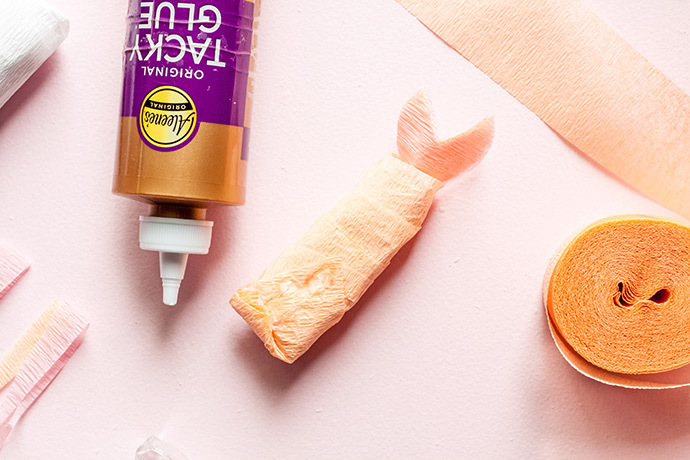 Place another strip of glue at the end of the roll, and press the streamer down, folding it to the inside of the roll. 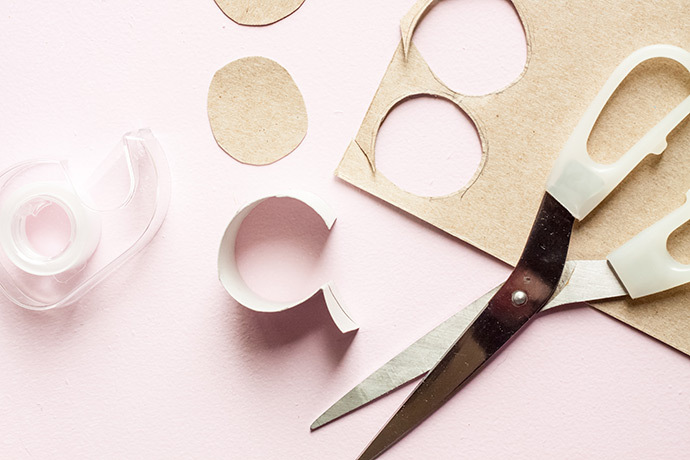 Cut several pieces of white streamers in half, and cut the little strips into skinny pieces using fringe scissors. Regular scissors will work too, but it will take longer. 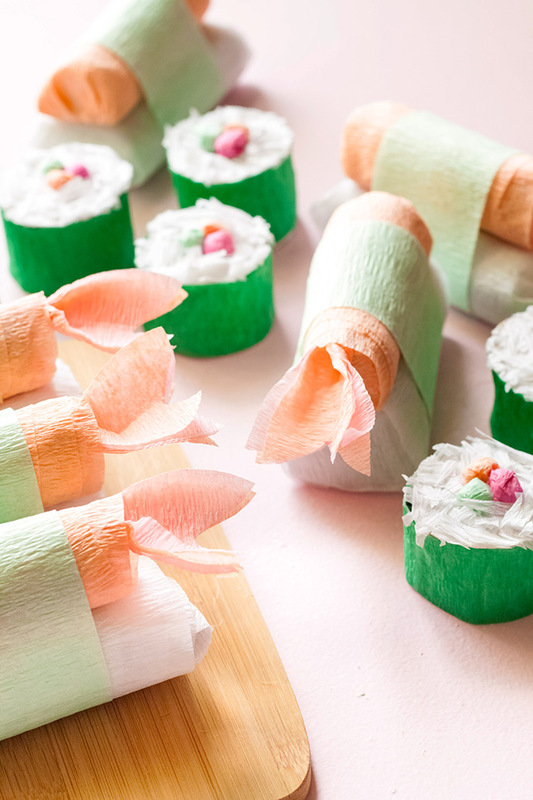 Place a layer of glue on one whole side of your sushi roll, and place the white fringed streamers over the glue. 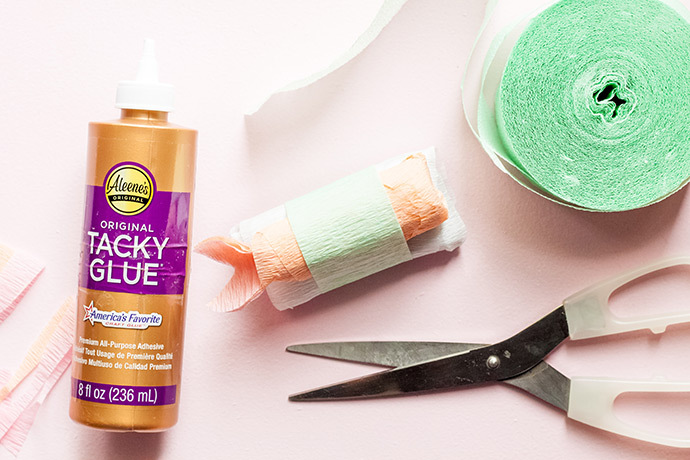 Pile it up, press it into the glue, and shake off any excess. 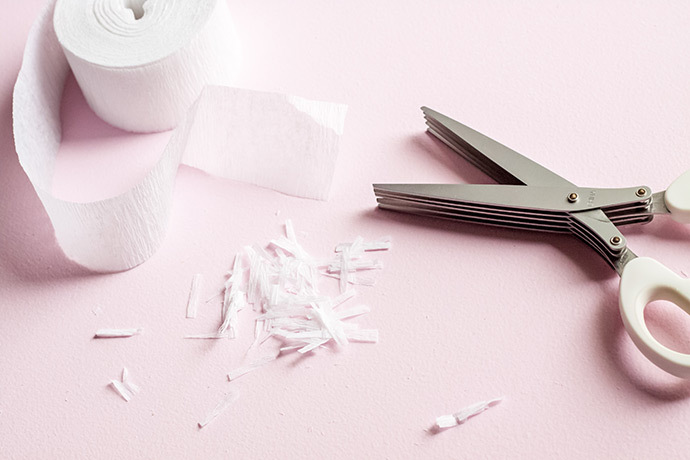 Trim the edges of the white fringe using regular scissors. It should look well-manicured! 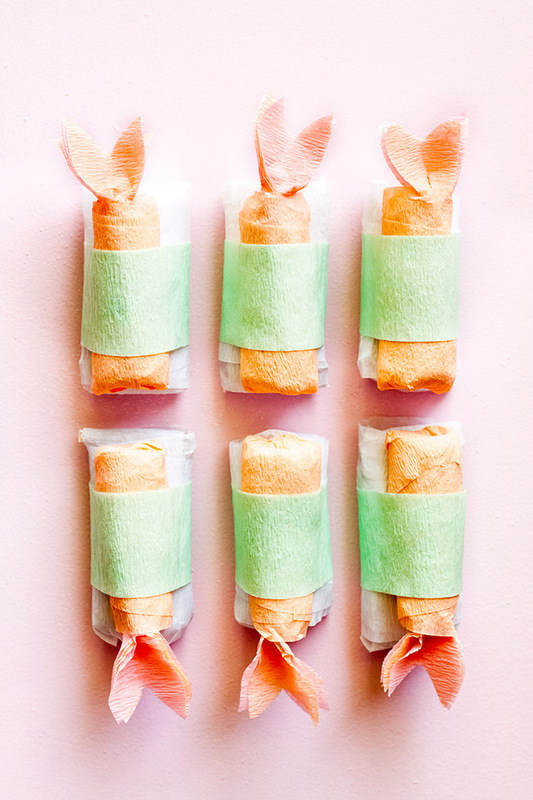 Roll a 2 ½” strip of peach, mint green, and dark pink streamers into three separate balls. Glue the balls together in the very center of the white fringe on the side of the sushi roll. 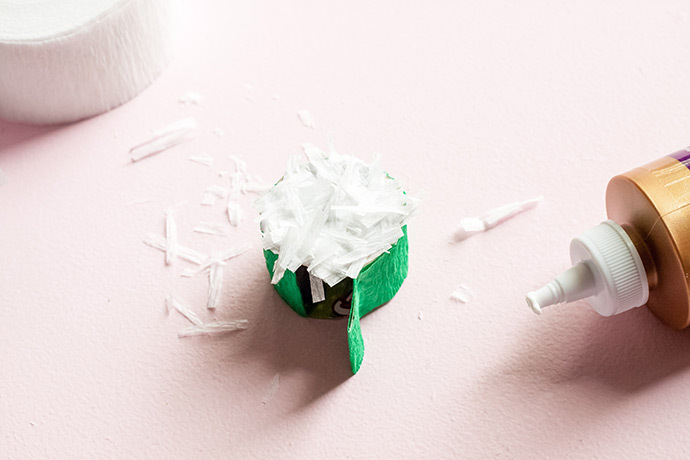 Once everything has dried, you may want to flip the roll over and glue a layer of white fringe streamers to the other side of the roll. Make it a thin layer just to cover the cardboard, and trim the edges using scissors. 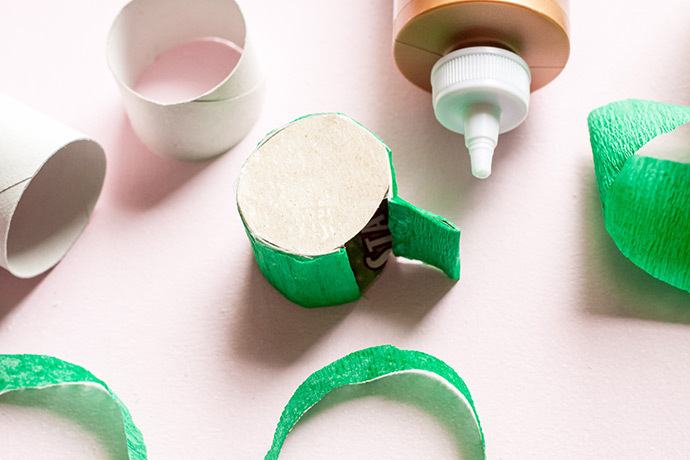 Place some tiny prizes and/or candies inside the roll, and tuck the open flap to the inside.